If you have never been to SEMA before, it is an absolute showplace for vehicle builds. The cars and trucks out there make the amateur builder weep in his pillow. One of the main things that has always jumped out to me is how unbelievably clean and sparkling all of the vehicles are. How do the builders do it? How can we compete with our build? 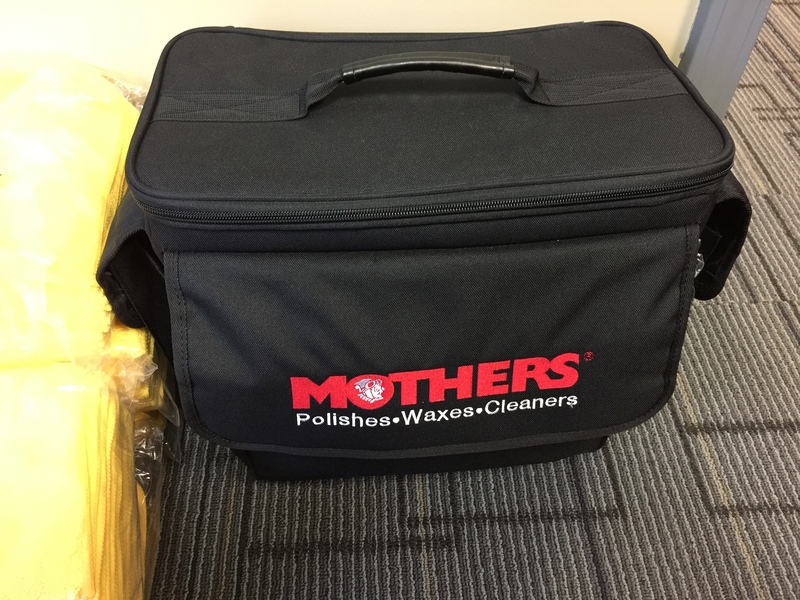 Mother’s has offered to sponsor our Jeep build and has provided all of the polishes, waxes, cleaners, microfiber cloths, and cleaning buckets we will need. Victor Golden, Rightline Gear’s Warehouse and Shipping Manager, has been recruited to be a part of our SEMA team. That means plenty of driving on the way from Asheville to Las Vegas and a special job once we arrive. Victor will be in charge of cleaning and prepping the Jeep for our booth everyday. You could say that he will be one mother of a cleaner! You could probably also say that he will get to boss the rest of us around. So on a perfect Saturday, we have decided to put the Mother’s products through a dry run. We want to know what to expect once we get to Las Vegas. 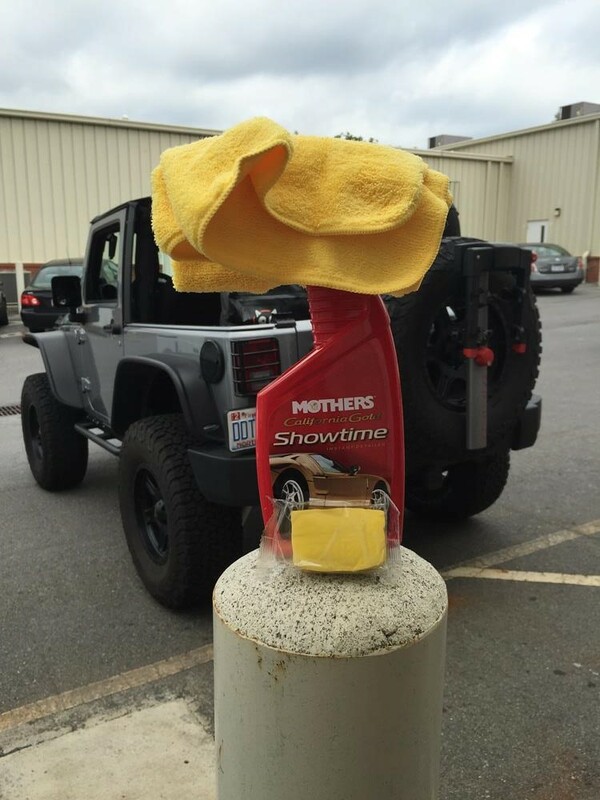 Victor started by washing the Jeep with Mother’s California Gold Carnauba Wash & Wax. 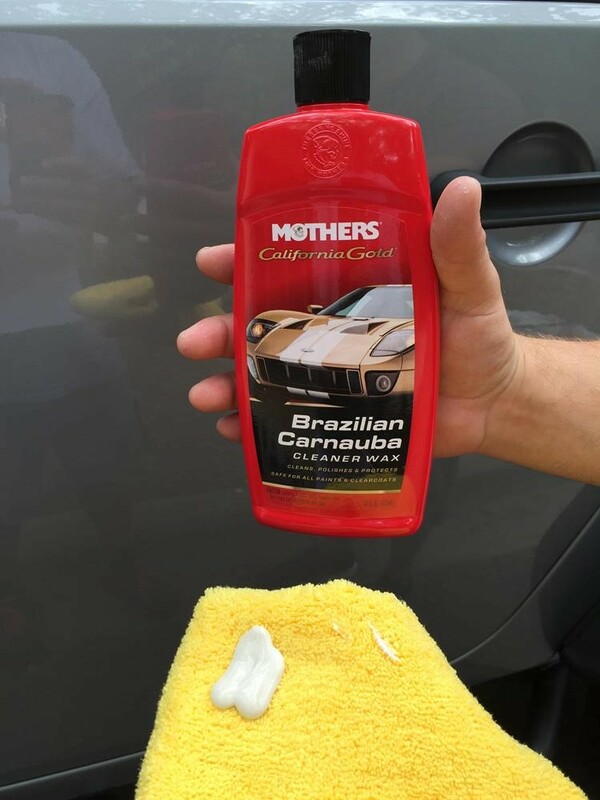 The California Gold line of products is Mother’s high end paint care line. Next it was time for the clay bar treatment to remove embedded grains of metal, tree sap, airborne environmental deposits, and dead bugs from the paint. 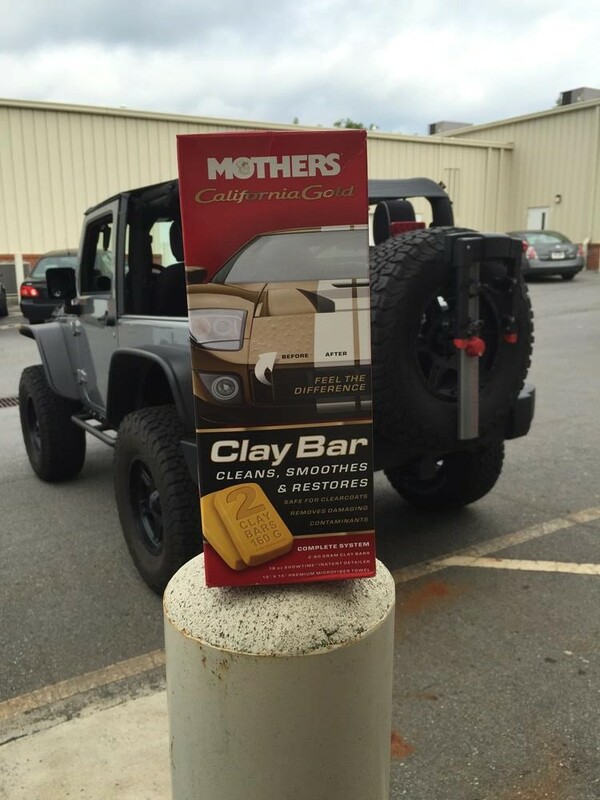 The clay bar picks up the junk that washing or waxing doesn’t get. 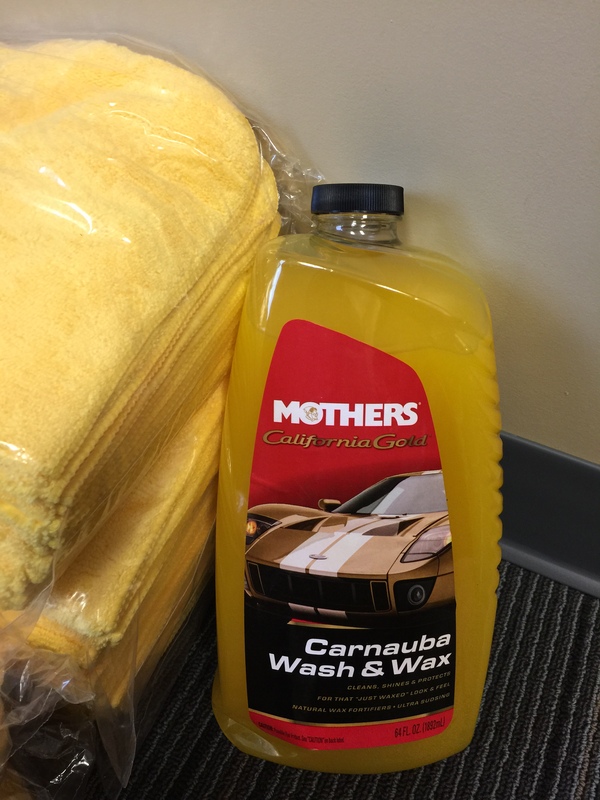 The Mother’s kit includes (2) clay bars, Showtime instant detailer, and a mircofiber towel. All you need to do is spray some of the instant detailer in a small area, rub the flattened clay bar back and forth over the surface, and wipe the surface dry with the towel. 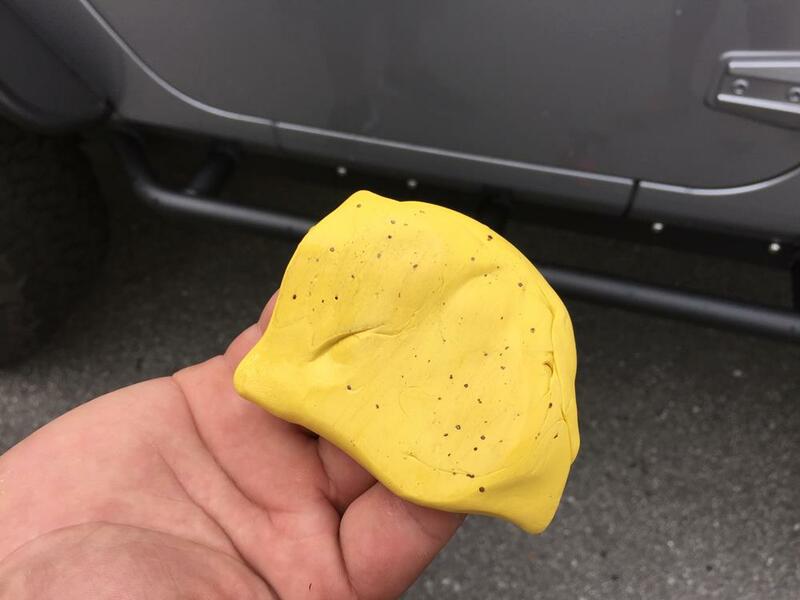 If your clay bar looks as below, it is time to knead the clay until you get a clean surface again. After the clay bar, it is time to move onto the California Gold Brazilian Carnauba Wax. What a great shine! Mother’s doesn’t ignore the plastic trim pieces on the outside of the Jeep. 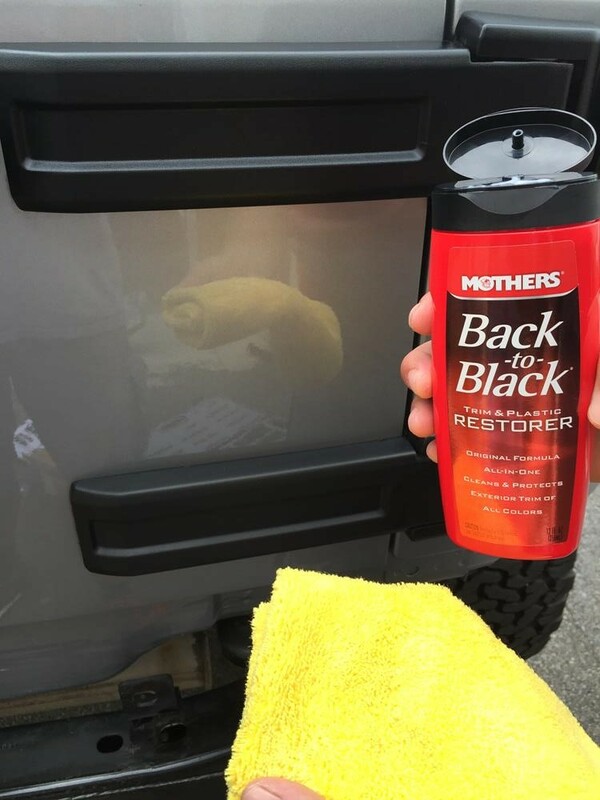 Check out their Back To Black Trim & Plastic Restorer. The top piece has been treated, the bottom piece untreated. 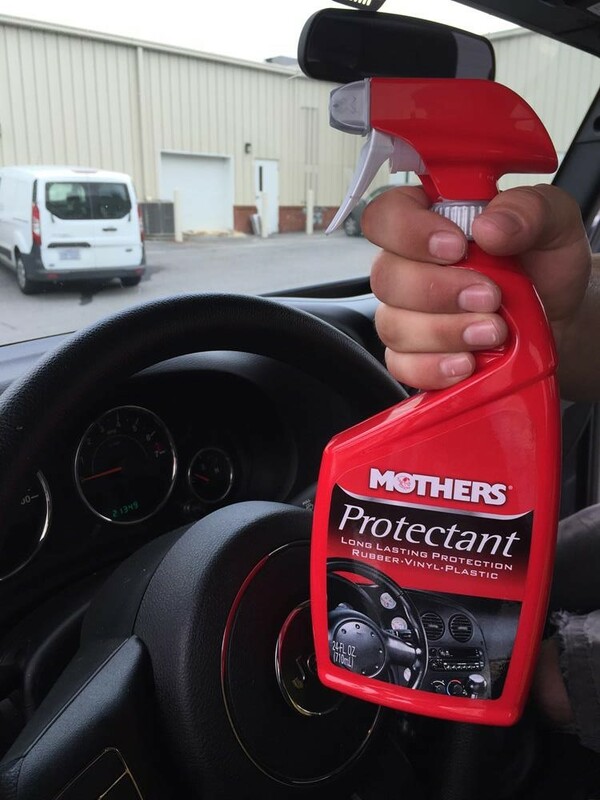 To dial in the right product for the job at hand, Mothers also has a Protectant for the rubber, vinyl, and plastic on the inside of the vehicle. But wait, they even have a product for the clear plastic instrument panel. I have always hated using a dash product on the instrument panel. No matter what, you are always left with a hazy or spotted finish. 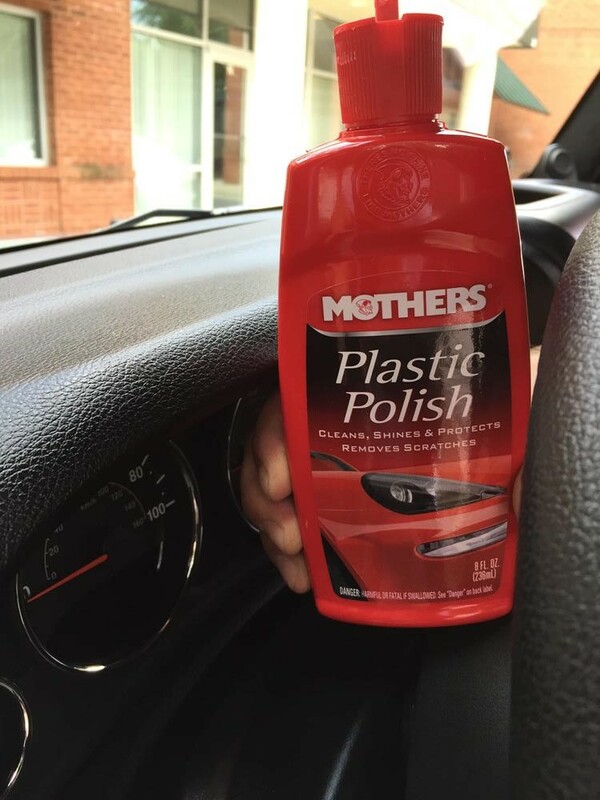 Mother’s Plastic Polish can also be used on tail lights, turn signals, and other plastic parts. 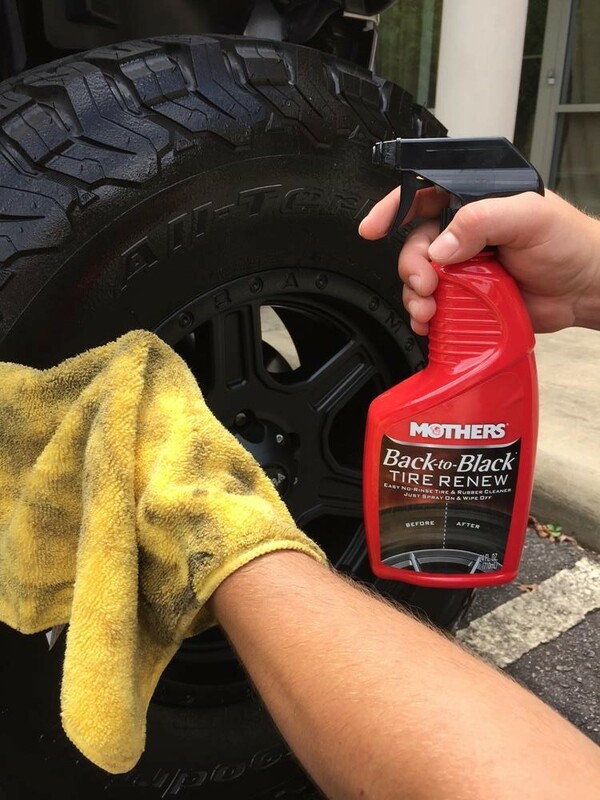 Victor did a bang up job on the tires using Mother’s Back To Black Tire Renew. The Jeep’s brownish tires ended up with a deep black appearance again. My windshield and rear view mirrors have been nasty for some time. I am always skeptical about glass cleaner-sometimes it works and sometimes it doesn’t. 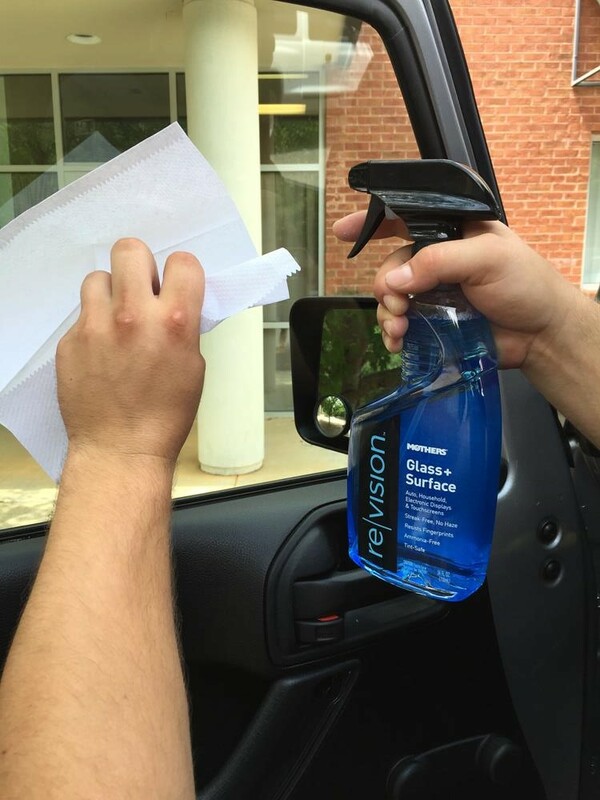 Enter Mother’s Re|vision Glass Cleaner and a spectacularly clear windshield. This problem has been solved forevermore. We felt that paper towels work better than the microfiber towels on glass. Our dry run was a success and I have a sparkling Jeep for the rest of the weekend – not a bad deal. Look for Victor in our booth at SEMA. He will be the one sporting the awesome Mother’s detailers bag.